I love the fall! My fall decor is some of my favorite. 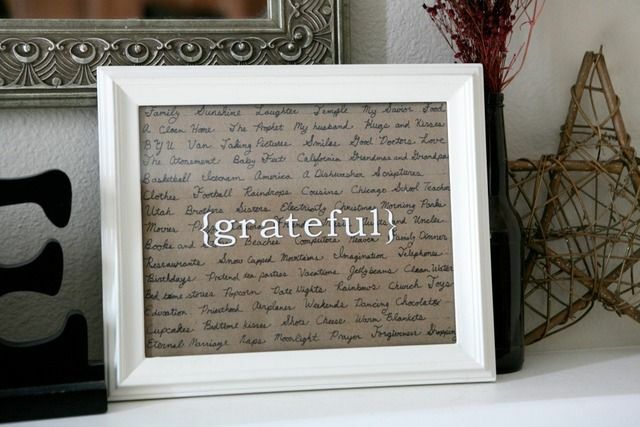 This year I am adding a new grateful sign to the decor. Once a month I get together with a group of friends and we all bring projects we are working on and visit and craft together. There is often more talking than creating but it is so much fun. This month, several of us were inspired by the project found here on Pinterest and wanted to make our own. I started with a simple, black 8X10 picture frame. I spray painted the frame Rustoleum Heirloom white (available for half the price at Home Depot). This is a beautiful color that isn't a true white, but more antique looking. I then cut a piece of brown contractors paper to fit in the frame. I used the back of the photo frame for a template for the correct size. I then measured and lightly drew straight lines across the paper with pencil every 1/2" as I knew I would never be able to write text straight without it and it really does not take away from the piece at all. 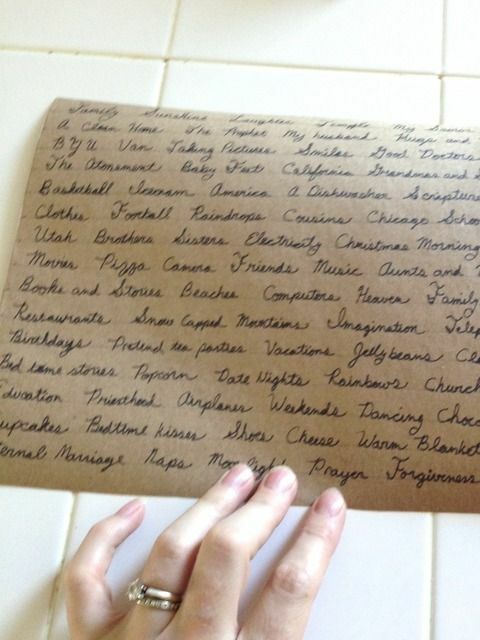 I began writing with sharpie what things I was grateful for as I thought of them, so in totally random order. Leave a little room on all four sides or when you put it in the frame they might get cut off. 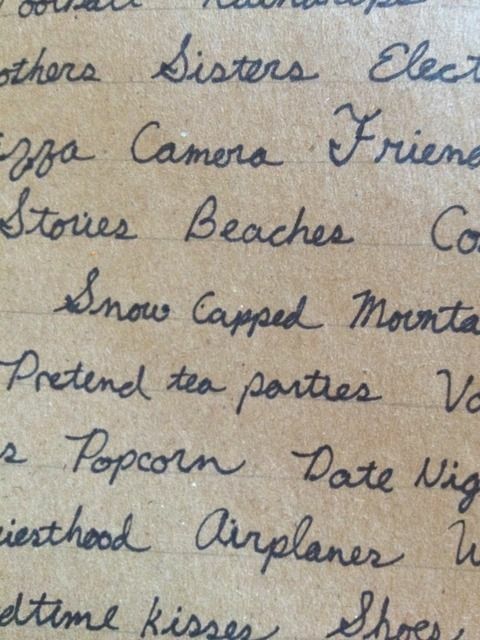 I had to pull up a web site with how to write letters in cursive as it is amazing how many capital letters I don't remember anymore. Don't worry if you don't have the best writing, I certainly don't- there is enough text and it is small enough that even imperfect writing still looks great. You can use a bigger frame if wanted but the bigger the frame the more you will have to write. Then I just simply put the brown paper in the frame and put the back on, just like putting a picture in a frame. Then I used my Silhouette to cut out the word grateful. I used Bookman Old Style font and my font was 6" long and just a little over 1" tall. 6- Place Sticker and Enjoy! I measured to find the mid point of the frame and tried to line up the words as evenly as possible. Let me know if you try it, I would love to see your finished product! You can find my other projects by clicking here or on my DIY/Projects tab on top. Will be linking up with the following crafting parties this week. I can't even tell you how much I love that! AWESOME idea! That looks great and so easy! I love this! It is gorgeous!! That's great that you've got a group of girls with the same interest as you. Doing something with someone else always makes it so much more fun. That's how I feel about the girls I run with! That is super cute! Ive been looking at crafts all weekend, this is one I want to try. That's really cool! I love it...you are Miss Crafty! That's really cute. You could do a lot of things with that. Like a "family" one, with the names of family underneath. Fun. I love it!! I'm sure that if I did the same project it wouldn't turn out as straight and perfect as yours is! That is really cute! I really like it Em! This is so adorable! I even have an extra white frame....but not a Silhouette. I love the idea of a craft group. And your grateful sign is fantastic! I LOVE the idea of a craft group. Do you rotate houses? I love your project. What a beautiful idea! I am sort of in love with it. At some point in time, hopefully soon, I am going to have to try this. Emmy, you are so creative! Thank you so much for sharing! Thanks so much for sharing this idea. I've featured it in my Top 10 List of Handmade Gifts. Love this! Pinning it to my projects board!